Michigan is a place where anglers can take up their rod and fish year-round with the expectation of having fantastic experiences. Winter is no exception, with thousands of lakes open to ice fishing. 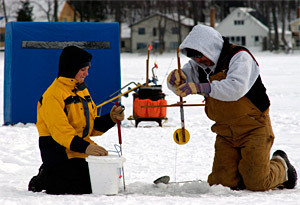 Although not everyone’s first pick for recreational activity, ice fishing attracts thousands of Michigan men and women – according to some estimates, roughly a fourth of all Michigan anglers say they fish through the ice – who brave winter weather to keep on fishing. Many say they actually prefer fishing through the ice to the open-water sport. “Ice fishing is a terrific way for the entire family to enjoy Michigan’s world-class fisheries during the winter season,” said Darren Kramer, northern Lake Michigan unit manager for the Michigan Department of Natural Resources (MDNR). 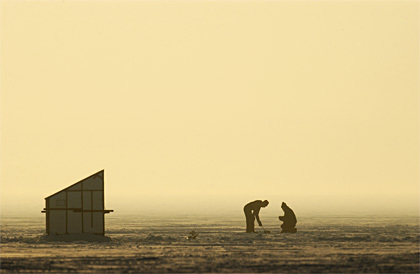 Ice fishing can be as simple – or as complex – as an angler chooses to make it. But for beginners, there’s not a lot to getting started. Anglers need just three things: something to make a hole in the ice with, something to clear that hole and keep it open, and something to fish with. There are two basic tools for opening holes in the ice, spuds or augers. Spuds are long-handled tools with chisel-like heads used to gouge holes through the ice. A spud is all that’s needed when the ice is relatively thin. 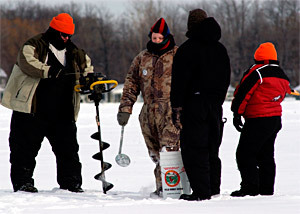 As the ice thickens, however, an auger – a corkscrew-like device with cutting blades on the end – allows anglers to drill a hole. As the ice gets extremely thick, power augers driven by batteries or small gasoline engines are extremely helpful. Once a hole is opened, it must be cleared. A skimmer or slush scoop – which resembles a ladle with holes in the cup – can remove slush and ice from the water surface in the open hole. Plastic skimmer or scoop models are inexpensive and available wherever fishing tackle is sold. The vast majority of anglers fish the same way they do during open-water season – with a rod or pole. It can be as simple as a thin dowel with a line attached to the end or it can be a high-dollar rod made of modern materials with an equally expensive reel. There are countless options in between. Many anglers begin with simple fiberglass rods with small spring-tension spools to hold line, and they never see the need to upgrade. “I think that one of the real attractions to ice fishing is that an angler doesn’t need to buy a lot of expensive gear to get started and try it,” Kramer said. And although you can catch all species on the simplest gear, all sorts of tackle exists for anglers who specialize in particular species. The most popular fish targeted by ice fishermen are the same as those sought by most open-water anglers: panfish. Bluegills, sunfish, yellow perch and crappie are all highly sought as they are relatively easy to catch and make fine table fare. 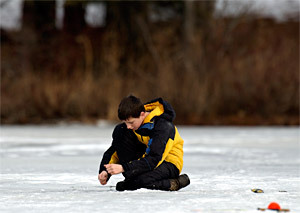 “Panfish are terrific for introducing kids, family and friends to ice fishing for the first time,” Kramer said. Small weighted hooks, such as tear drops or jigs, tipped with insect larva are the most popular baits, though some prefer minnows, especially for perch or crappie. But some eschew bait completely, although they use weighted flies or artificial lures, such as tiny spoons or plastic-tipped jigs. Walleye are among the more glamorous quarry of anglers. Plenty of others prefer to fish for the various species of trout. Still others prefer pike or muskellunge, which brings us to other forms of fishing beyond rods and reels. Tip-ups are devices that are set on the ice above the hole and are used to suspend bait in the water column below. Tip-ups feature spring-loaded flags that “tip up” when the bait is taken, alerting the angler to the strike. Tip-ups are most commonly associated with pike fishing, though they can be used for any number of species – walleye, trout, even perch. Because anglers are allowed to fish three lines, many set tip-ups while actively fishing with rods. 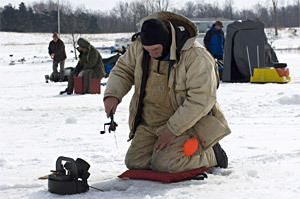 Others – particularly those who target pike, muskie or sturgeon – prefer spearing. Simply put, they cut a large hole in the ice, usually with an ice saw or chainsaw, and sit beside it, waiting for a fish to swim into range. Most spearing takes place inside shelters, as it’s easier to see into the water when the light is blocked. This has given rise to the term “dark-house” spearing, and many spear fishermen build comfortable shacks (commonly called shanties) to fish from. 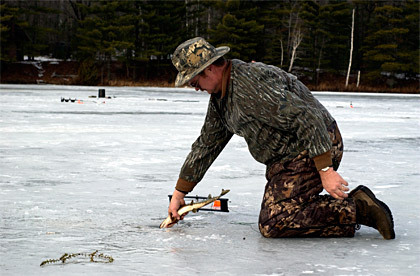 For more on spearing – check out PikeSpearing.com. 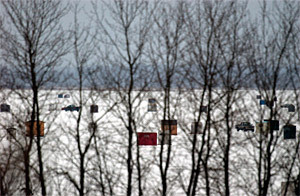 Most anglers use portable shacks they can drag out with them and remove from the ice when they leave for shore. Anglers who spear typically use decoys – either live or artificial – to lure fish into range. There are many restrictions to spear fishing, so be sure to consult the Michigan Fishing Guide for information. Although many rod-and-reel anglers are content to sit on a bucket (which doubles as a gear carrier) on the ice while they fish, it can be miserable – even unbearable – during the depths of winter. Portable shanties not only block the wind and elements, they allow anglers to use small heaters, making the experience less physically taxing. Either way, it’s important to dress for the weather, even if you’re fishing from a well-appointed, insulated shanty. It can be awfully cold getting there. Moisture-wicking underwear helps keep anglers dry. You can work up a real sweat trudging across the ice, especially if you’re dragging a shanty or carrying heavy equipment, and wool clothing continues to provide warmth even when wet. Modern, insulated outerwear made for ice anglers is sure to keep you warm. Waterproof boots are de rigueur, and moisture-wicking socks, under wool socks, are helpful too. A thermos of a hot beverage – alcohol is not recommended – will help keep anglers warm on the ice. Those interested in ice fishing, but who are wary of the learning curve, might find it helpful to attend one of the Hard Water Schools offered most winters by the MDNR at the Carl T. Johnson Hunt and Fish Center at Mitchell State Park in Cadillac. These sessions, led by seasoned anglers and DNR staffers will teach you everything you need to know to get started ice fishing, and include an afternoon on the ice with hands-on instruction. To find out when the next classes are scheduled and to register for the Hard Water Schools, visit www.michigan.gov/outdoorskills. 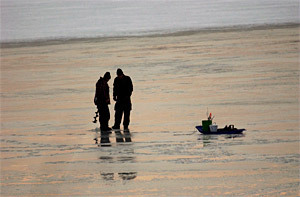 Another opportunity to try ice fishing is during the DNR’s Annual Winter Free Fishing Weekends. During this weekend, anglers may fish without having to purchase a fishing license. However, all fishing regulations on daily bag limits and other provisions still apply. Also, be sure to read this sidebar story about ice safety (PDF). Find more upcoming stories and articles from the MDNR by subscribing to free, weekly “Showcasing the DNR” articles. Check out previous Showcasing articles.